In general, the effects in this direction tended to be weaker and less dramatic, even at the extreme ends of the distribution. Speculating wildly, I’d venture a guess that given the endurance characteristics in skiing, you’re just more likely to have people with skill sets that lend themselves toward longer distances, all things being equal. Manificat isn’t necessarily known for his sprinting, but he seems to have done better (in qualification, at the very least) on sprint courses closer to 1km. I find that kind of interesting because I generally think of him as being stronger in longer distance races (i.e. 30km+) though I haven’t looked at any data to check that. 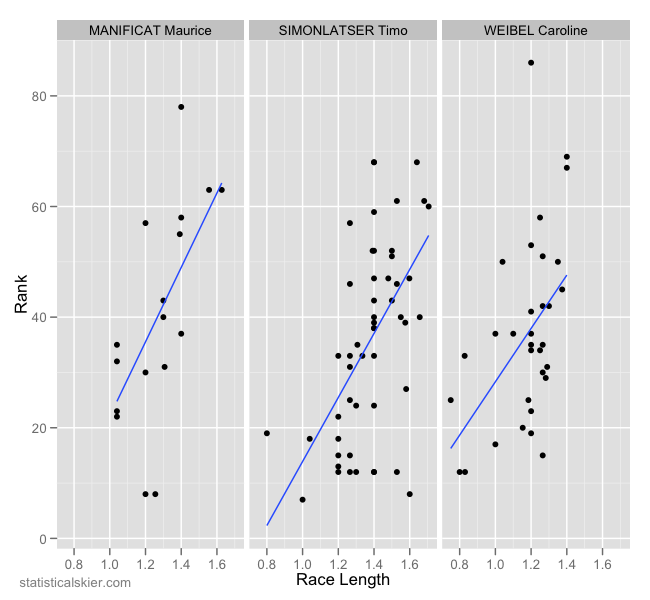 It’s tempting to dismiss Simonlater’s trend as being the result of those three shorter races. But even if you exclude them, you can see a fairly abrupt break in performance right at 1.4km. It’s verging on being a step function, rather than a continuous change. Weibel’s trend is the most marginal, in my view. Posted by Joran on Thursday, September 27, 2012, at 6:00 am. Filed under Analysis, Cross Country. Tagged Analysis, caroline weibel, course length, maurice manificat, Sprint, timo simonlatser, World Cup. Follow any responses to this post with its comments RSS feed. You can post a comment or trackback from your blog.